As lawyers, who ourselves have taken a solemn oath to defend the Constitution and the rule of law, we rise together to protest President Trump’s abject failure to meet his Constitutional oath and obligations. Instead, during his current term of office, he has assaulted and trampled upon our Constitution and laws repeatedly, and has thoroughly disgraced and sullied the Constitutional Office of President before our country and the world. Ours is a nation of laws, with an executive branch of significant but distinctly limited powers. This has been the foundation of our democratic system of checks and balances since the Founders rejected a proposal for a quasi-monarchical lifetime presidency. The idea that a President can do no wrong and is answerable to no one is contrary to our national heritage and laws. We are all bound by the law. Those who subvert the rule of law must be held accountable, including the President. During his time in office, President Trump has continuously made clear his contempt for the Constitution and the rule of law. He fired FBI Director James Comey, as he later admitted in a television interview, in order to end the investigation into his campaign’s dealings with Russia. He has attacked and smeared law enforcement officials associated with the Mueller investigation and repeatedly threatened to intervene to obstruct its completion. He has impugned the integrity of federal judges and members of Congress, and encouraged police misconduct. He has continued to receive profits and benefits from foreign governments in violation of the Constitution’s Emoluments Clause. He has called our free press “an enemy of the people,” and threatened to undermine the First Amendment. Accordingly, we the undersigned attorneys pledge that we will do all that is in our power to ensure that President Trump is held accountable for his attacks on the rule of law. We will engage in peaceful protests, and take advantage of our role as community leaders to promote understanding of the rule of law and the seriousness of the current situation. 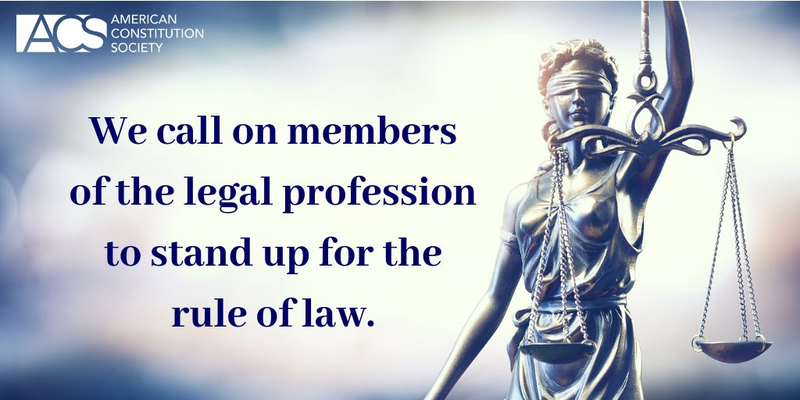 We will make our voices heard in the media, within our bar associations and other civic associations, and we will call on our representatives in Congress to speak out as well. The importance of the entire legal profession to be heard in defense of the rule of law in this moment of crisis cannot be overstated. We have taken on many important causes in our varied careers. None has been more important than this. We cannot, and will not, fail. Pledge to defend the rule of law today.